Kyllini lies on the west coast of the Peloponnese, in the region of Ilia, just 45 minutes from the airport of Araxos and 100 km from the seaport of Patras. 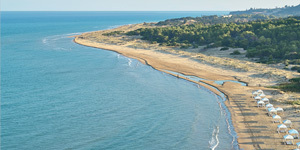 The Peloponnese is one of the most unspoilt areas remaining in Greece. The region combines images and scents of the sea and mountains, of grapes, olives and citrus. Every corner of this land brings to mind some myth or historical event. The sandy beaches, the quaint villages and warm Greek hospitality make for an ideal climate for family holidays. During classical times Olympia was the city of ilia best known as the area where the Olympic Games took place, the greatest athletic event of the then-Greek world. Today ancient Olympia is a village and a municipality of ilia, built in the valley of river Alpheus. Nearby lies the archaeological site, one of the most popular ones in Greece, which attracts every year tourists from all over the world. Explore the places of interest that should not be missed in Peloponnese. Villages & Towns with incomparable natural beauty await exploration.